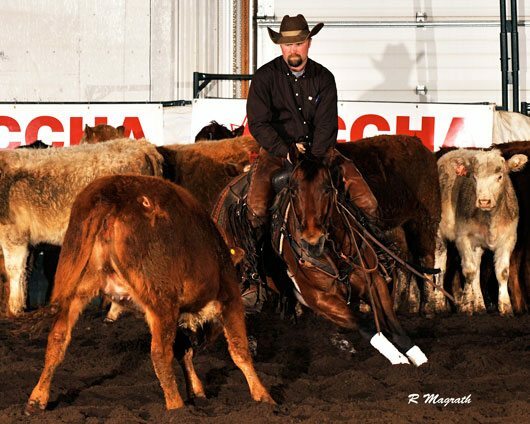 Open Champion Dustin Gonnet riding My Own San Lena owned by Al and Ria Gerla with an aggregate of 293.5. 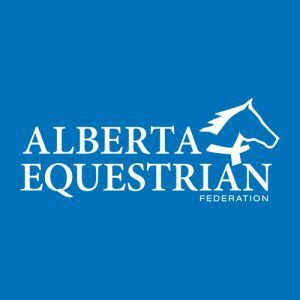 This spring the Canadian Cutting Horse Association (CCHA) hosted the third annual Canadian National Championship Finals at the Cow Palace in Olds, Alberta. 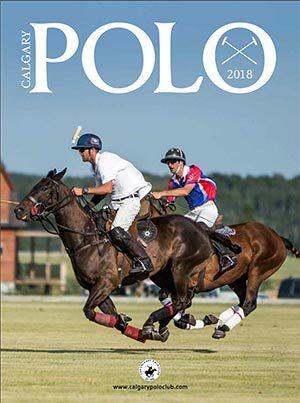 The show featured the top five competitors from each affiliate association (BCCHA, ACHA, SCHA and MCHA) based on points earned at CCHA approved shows. 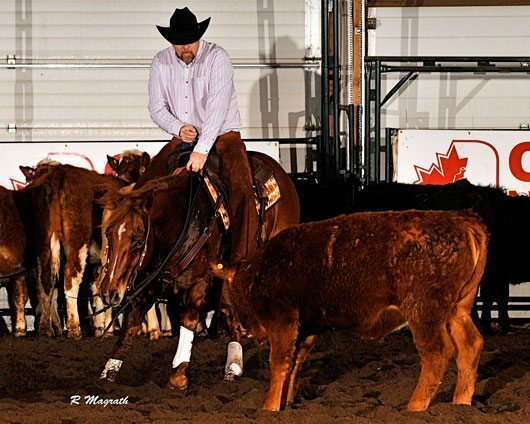 The show ran April 9, 10 & 11th and despite the unexpected freak snowstorm, did well to feature the best of the best in Canadian cutting horse talent. 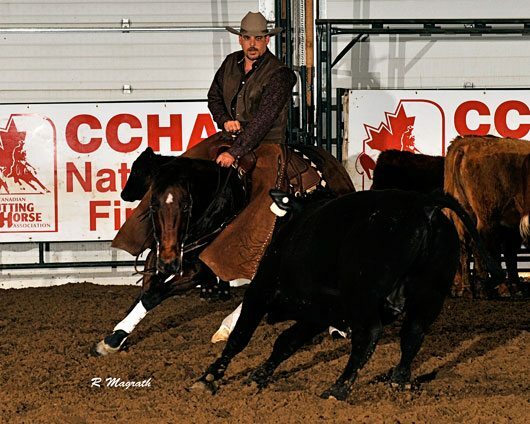 This year, cutting horse trainer Dustin Gonnet of Cayley, Alberta stole the show, winning the Open Championship, the Open Reserve Championship and the $10,000 Novice Horse Championship. In the Open, Gonnet rode My Own San Lena to victory with a remarkable total aggregate score of 293.5, earning $1,564. 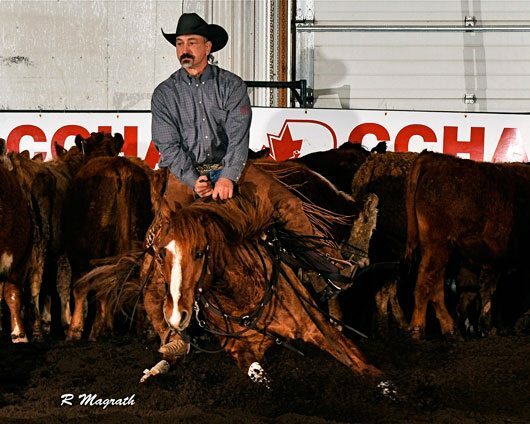 This mare, owned by Al and Ria Gerla of Busby, Alberta, has been a strong competitor in the Canadian cutting horse circuit for a number of years. 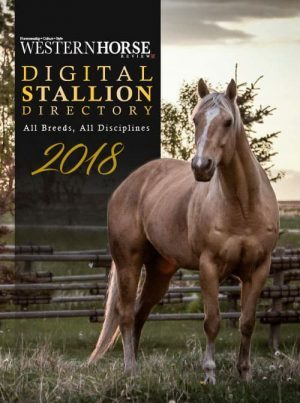 Last year at the 2008 Canadian National Finals, My Own San Lena and owner Al Gerla tied for the $20,000 Non-Pro Championship and won the $10,000 Novice Horse/Non-Pro Championship. 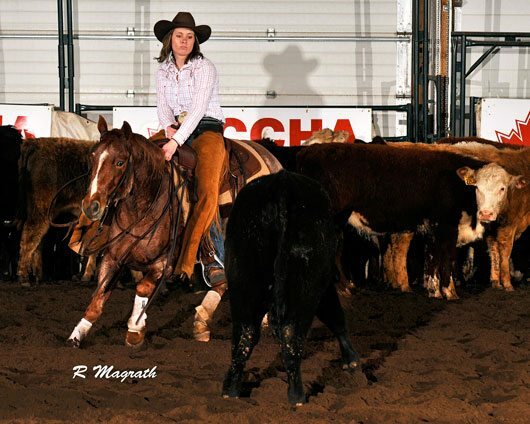 Gonnet, who has worked with her only a short time, knows she is “a really good mare. 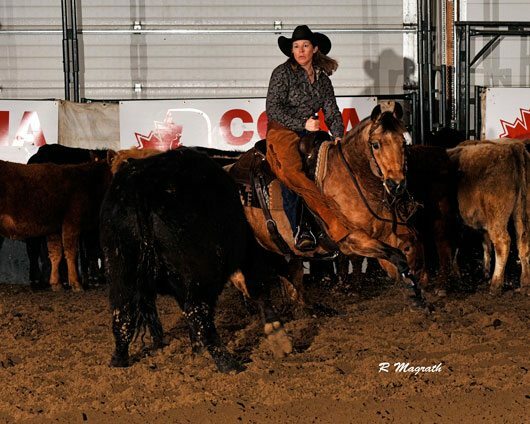 She’s got tons of expression on a cow and is electric when it comes to [the show pen].” Now in her 8-year-old year she continues to be a well rounded horse, capable of competing in the Open, Non Pro and the Youth divisions; a unique attribute for any cutting horse. With plans to secure the Open Championship in Canada this year, the pair is certainly on the right track. 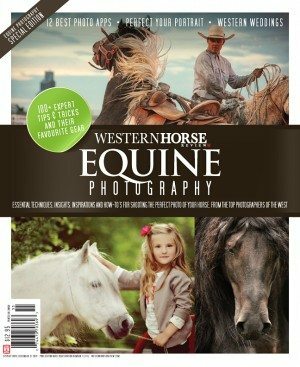 Enjoy these shots from the show and read the full story in the June issue of Western Horse Review. 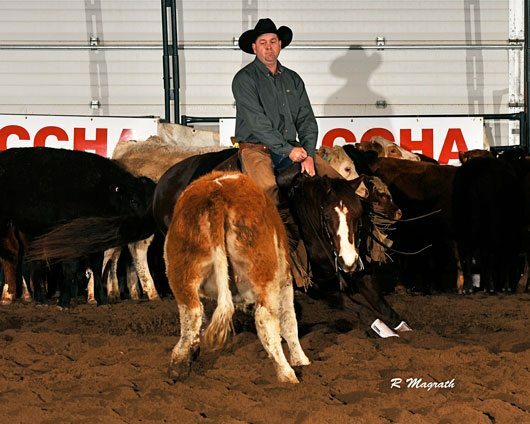 Non-Pro Scott Wardley riding Smart Little Koolio with an aggregate of 286. 3000 Novice Horse Champion Clint Christianson riding Rio Smart Hickory owned by Greg Grills scoring 291.5. 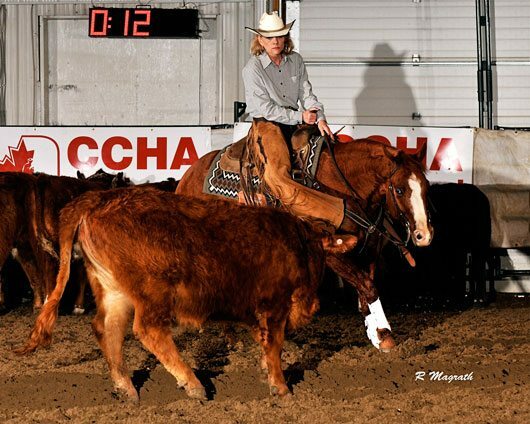 $15,000 Nov Horse Non-Pro Champion Sandy Reid riding Instants Bucks with an aggregate score of 289. $5,000 Novice Horse Non-Pro Champion Dawn Hanson riding Quick Pepcid scoring 290.5. $50,000 Amateur Champion Neil Shanks riding Call Me Smurf with an aggregate of 290.5. $20,000 Non-Pro Champion Monica Heintz riding Pepino Boon with an aggregate score of 286.5. $10,000 Amateur Champion Tony Piattelli riding Fairlea Hickory Pep with an aggregate score of 287. $2,000 Limit Rider Champion Kelly Park riding High Power Pepto owned by Bill and Elaine Speight scoring an aggregate of 290.5. 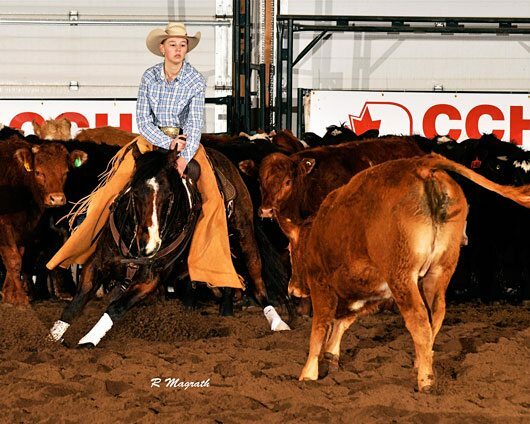 Sr Youth Champion Madison Sawchuk riding CD Whirl with an aggregate of 289. 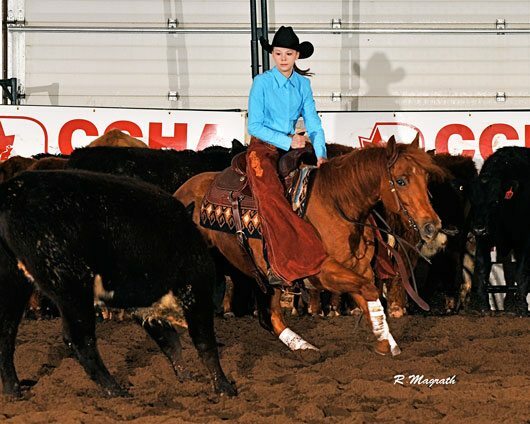 Jr Youth Champion Carly Christianson riding Bob Playin owned by Deb Harrison-steel with an aggregate of 292. 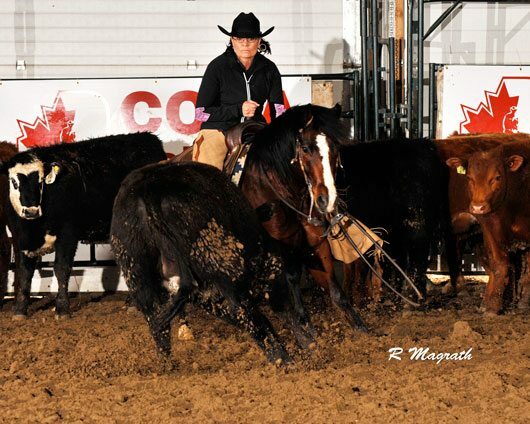 $10,000 Novice Horse Champion Dustin Gonnet riding Lizzys Play Girl owned by Rob Leman scoring 294. You do a greait jobwith this post! I love all of them!|A kind of usefultopic.